Vintaqe - Tuscan/Royal Tuscan Fine English Bone China Tea Set - "Rosalie" Pattern - Made during the 1947 time frame - Totaling (34) Pieces, having a Service for (10) Ten. This Vintage "Rosalie" Pattern by Tuscan/Royal Tuscan Fine English Bone China is a beautiful Pink Rosebud, with Green and 22kt Gold Leaves. That being the basic pattern, it also has a 22kt Gold Fleur De Lis Edge. The 22kt Gold on this Tea Set, is very Bright, and covers the Rims, inside of Cups/Sugar Bowl, and a Large Band of 22kt Gold on all feet. Handles of Platters and Cups are also trimmed in 22kt Gold. 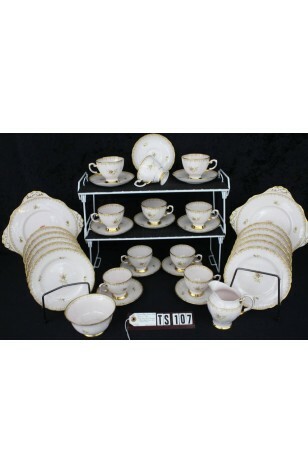 If "Gold" is your passion, this Service for (10) Ten Tea Set, is for you.!! 10 - Bread, Dessert, Tea Plates - 7"